Jackie, the founder of Open Door, is no longer running the centre in France but is now traveling and organising Open Door dialogues & retreats in different parts of the world. Open Door also diffuses information about likeminded events and centres worldwide. Open Door dialogues are inspired by the Teachings of J.Krishnamurti. However, all questions raised will be approached as our own: In dialogue we think for ourselves rather than follow and rephrase the insights of others. 2015 is in full flow. It is the dry, winter season here at Stream Garden. A soft breeze blows through these warm winter months, and the quiet rustling of the forest offers relief and freshness from the tropical heat. This is the tourist period in Thailand, and SG has had a number of retreat visitors from Italy, Spain, France, Germany, Holland, Denmark, Belgium and Switzerland to start the year, as well as groups from Europe, Malaysia and Thailand. Last year ended with the Annual International Krishnamurti Gathering. Alongside our Thai friends, many others came from abroad – this created a rich mix of people and an intensity of dialogue. The group was quite small (about 18) which encouraged intimacy and a freedom of interaction, even though many of the participants were new. This year began with a visiting Dance Workshop from Europe run by the dance coach, Jaap van Manen. Jaap has been running dance coaching sessions every year at the International Krishnamurti summer gatherings in Switzerland, organised by Gisèle Balleys. (See here for more information about the Murren gatherings). Although Jaap has given workshops across Asia, this was the first time he was organising a dance workshop at Stream Garden. The participants enjoyed exploration, freedom of movement, beautiful music to dance to, and an ever supportive non judgmental coaching. Krishnamurti DVD screening is always available at the centre: some dancers joined the retreat guests in the evening for video talks and dialogues in the wooden Thai-style Study. Retreat guests coming to Stream Garden to study J.Krishnamurti or to follow their own retreat inquiry, mix naturally at meal times* with the visiting seminar and workshop groups. These groups are hosted at the centre, and they come with all kinds of programs including yoga, detox and social inquiry. For the rest of the day, retreat guests and visiting groups part company to follow their own particular activities, and at night they sleep in separate areas of the spacious forest campus. 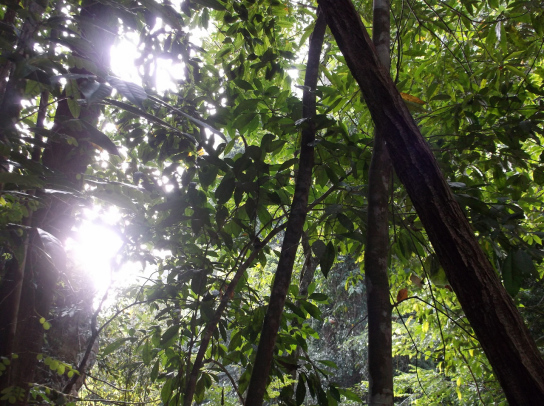 In this way, quiet inquiry and workshop activity share the space, and a break from everyday life... close to nature, amid the intriguing sounds and cool shade of the tropical forest. The delightful butterflies fluttering around Stream Garden are for all to see. Stream Garden is rooted in a deep interest in J.Krishnamurti and education. Groups hire our facilities and run their own workshops, despite not necessarily sharing this ground interest. As long as our group visitors respect and appreciate the quiet ethos of the centre, we gladly open this beautiful forest centre to a rich variety of appropriate activities. We take care however to remain clear that groups do not equate their personal programs with Krishnamurti or his reputation. An interesting off shoot of opening to groups: some participants spontaneously become interested in what we are about, and begin to show interest, buy books and DVD’s, and request deeper interaction. We in turn welcome the diversity of reality, life, art and activity these groups may bring in. As well as hosting visiting groups, we are fully involved at the present time in developing our own, on campus, extra curricular education programs for children and university students. Our ´Shout English´ camps and theatre weekends are steadily growing in popularity. The last 9 day camp even had to create a waiting list! To find out more about retreats, Krishnamurti gatherings, and other activity programs offered here at the centre, please visit the new Stream Garden website. If you organise your own groups and workshops and are wondering about a totally new environment to host your activity, check out the Renting out to groups page and feel free to contact us for any added information. Thanks to all Stream Garden friends for the care and help offered after the last newsletter! Once again, if you are interested in supporting Stream Garden and what we are trying to develop here, please forward this news to your friends and contacts... Thank you. Warm wishes to you all for a good year ahead... Happy Chinese New Year!